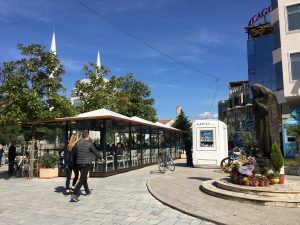 Prishtina Insight’s guide for where to eat, stay, and explore in Shkoder, Albania. In northern Albania, on flat roads surrounded by mountains of slate gray and navy blue, cyclists bustle about for their daily errands in north Albania’s cultural capital. Once an important economic center due to its flourishing Ottoman-era bazaar at the convergence of the Danube River and Aegean Sea trade routes, Shkoder was also marked by deep poverty and isolation in the 20th century. Kole Idromeno Pedestrian Zone. Photo: PI. All of this can be felt as you pass the castle overlooking the entrance of the city, the bustling pedestrian center, the gritty and green residential blocks, and neighborhoods where poverty and discrimination against Roma remain evident. From the castle, you can see the largest lake in Southeast Europe, which is shared between Albania and Montenegro, called Lake Shkoder or Lake Skadar. Its shimmering blue waters melt into the horizon. The city is most alive on International Jazz Day, April 30, when swarms of tirons take the train up and spend the weekend dancing in swing-era getup. But Shkoder’s mediterranean climate and relaxed vibe make for a great weekend trip throughout the year. The most direct way to get to Shkoder from Prishtina is by car, though you might also look into making it a stop on your northern Albanian biking and ferry tour. By car, the drive from Prishtina to Shkoder takes a little over three and a half hours. A pit stop along the route is in order: In Lezhe, you might stop for a view of Skanderbeg’s Tomb, or book a poetic dining experience at Mrizi i Zanave, Fishte’s farm-to-table restaurant. Gif: Jeta Dobranja/Trembelat for PI. You’ll know you’re in Shkoder the moment you hit city limits as the roads become swarmed with residents young and old on their bicycles. The city, with very few bike lanes yet a strong cycling culture, manages to create its own road system amid the chaos. Or a recent Sunday morning, several people biked in the light rain holding an umbrella in one hand, handlebars in the other, rolling seamlessly alongside cars. There are several hotels in the city center, most slightly dated but clean and affordable. Hostels, guest houses, and apartments listed on AirBnB start at around 10 euros per night, while villas on the lake go up to the hundreds. Tradita, just a short walk from the central pedestrian zone, is a 1694 home expanded into a boutique hotel and restaurant. In the early 20th century, the home was inhabited by Renaissance poet Filip Shiroka. Now it is under the ownership of a local family who strive to preserve its cultural value. Its rooms are cozy, some with charming balconies overlooking the sunny patio where families and friends drink coffee. Double rooms are priced at around 60 euros, but we recently booked online during the off-season for 45 euros per night. Nightly prices include a breakfast spread of hard boiled eggs, bread, hunks of butter and hard cheeses, candy-sweet jams, and the Balkan breakfast trifecta of olives, cucumbers, and tomatoes. If you’re visiting Shkoder from Prishtina, part of the pleasure of the trip is simply being able to stroll along the city’s wide sidewalks and green pedestrian center, called Kole Idromeno Street for the architect that designed many of the buildings. You’ll hear Albanian, Romani, and Montenegrin languages. Outdoor cafe tables soaking in the sun can be found everywhere. Shkoder has a sweet tooth, so rather than sitting for coffee, a lot of people are enjoying chocolate crepes or ice cream (Gelateria Bell Italia serves an affogato, and for Baklava, try Sofra). A lot of local fare is adapted from Italy’s influence on Albania. One of the nicest shops for gift-buying in the center is Idea Vino and Gastronomia, a small shop offering Italian wines and dried pastas. The Albanian-Italian connection is also notable in Shkoder with the immigration of Italian painter, architect, and photographer Pietro Marubi to Shkoder around the year 1850. Marubi taught photography to the sons of his gardener, Rrok Kodheli, one of whom, Kel, later inherited Marubi’s studio and took on his last name. Marubi-trained photographers sprung up in the city, and the family archive was donated to the state in the 1970s. 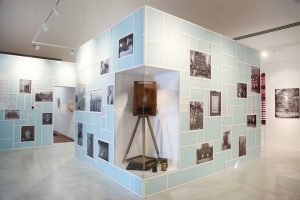 Now supervised by the Ministry of Culture, the Marubi National Museum of Photography showcases Marubi’s works depicting Albanian life and history. Adult tickets to the museum are 700 lek, or about five euros. After browsing the museum, you might pick up a book from the downstairs library to read on the small back patio. Also check out the Facebook page for Art House to see if the gallery has any open exhibitions or events. Photo courtesy of Marubi Museum, Facebook. With an empty afternoon, you also might spend an hour or two exploring the streets outside of the pedestrian zone. You can feel the air of ancient Roman history, but more evident are the domineering concrete socialist blocks, painted in tropical colors but covered in what appears to be black mold. The streets are lined with florists, barbers, and bar kafe where men gather as early as 5:00 am to watch television and talk. Caged parakeets hang in door frames, chirping in the humidity. 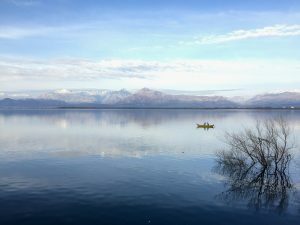 Afterwards, you could borrow a bike from your hotel or rent one downtown for a trip to Lake Shkoder for an early dinner at one of the many lakeside fish restaurants. At the Rozafa Castle, which dates back to antiquity, legend has it that a woman was sacrificed by her husband and was killed and buried as a ritual to strengthen the fortress walls. This patriarchal ‘fairy tale’ was in the back of my mind while strolling inside the fortress’ formidable walls. The scenery is best in spring or fall for a quiet view of the city during sunset; during summer it’s more crowded with selfie sticks and even opens a pizza restaurant built within its walls. Lake Shkoder. Photo: Prishtina Insight. 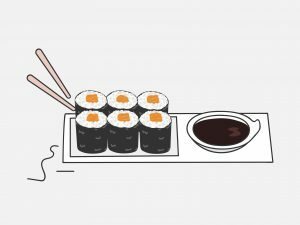 Our favorite place to eat is Sushi te Shoki, owned by a Japanese backpacker named Shoki Yokoyama who planted his roots in Shkoder over a year ago and decided to bring Japanese fare to the city, which previously lacked any Asian cuisine. It’s a tiny and cute spot. Nujabes, the late Japanese musician who produced mellow instrumentals sampling hip hop, plays low in the background; Yokoyama said that a customer of his turned him on to the artist. Illustration: Jeta Dobranja/Trembelat for PI. We tried the mixed nigiri and maki plate, salmon rolls, a bowl of ramen, and homemade ginger ales. We loved it all, and ordered seconds for two of our favorite rolls from the combination platter: the caterpillar roll and the flamed sea bream. Shoki works with local ingredients, and gets most of his Asian ingredients from Neranxi, a Tirana-based import company with a shop in Shkoder. 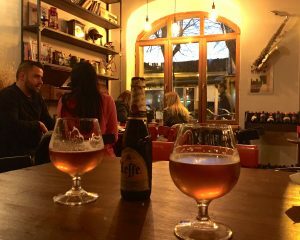 Speaking of imports, a favorite spot for drinks is Manifatura, located in the pedestrian zone, for its cold selection of bottled beers and campari soda. For a local drink, order a glass of rakia; they carry several homemade kinds distilled in the town of Puka, which also brews an excellent local beer (which is only ever served on tap and, unfortunately, is hard to find outside of its own brewery or Mrizi i Zanave). The best rakia on Manifatura’s menu is made from thana, or the Cornelian cherry, a ubiquitous sour fruit in northern Albania. 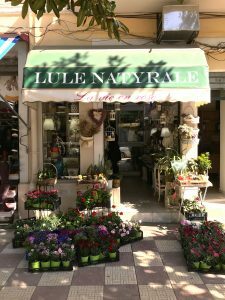 It’s easily to relax in their cozy cafe, named after the rug and textile shop that its building served until the ‘60s, or on the buzzing, friendly patio. Their Italian-style pizzas are pretty excellent, too. Whether or not you’re sleeping at Hotel Tradita, the restaurant is worth a dinner reservation for whole fish, fire-grilled meats and vegetables, and traditional tava. Just be prepared to hear live traditional or pop folk music on weekend nights, which usually starts around 9:00 pm and fills the dining room with reverb.